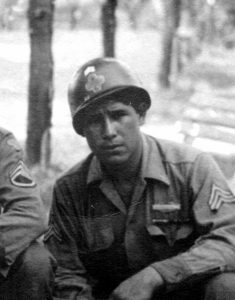 Adrian Cordova became part of the 88th Infantry Division with the assignment to clear the Germans out of Italy. How does a farm boy from Kosse, Texas, find himself knee-deep in snow in the Italian Alps, taking out German outposts dotting winding mountain roads? He becomes part of the 88th Infantry Division with the assignment to clear the Germans out of Italy. That is exactly what happened to Mr. Adrian Cordova, but that is also why Cordova had four memorable days in Rome. “I had bad times and I had good times,” said Cordova. The 88th Infantry Division, or, as Nazi radio commentator Berlin Sally dubbed it, the “Blue Devils,” was re-commissioned in July 1942, and assigned to Ft. Gruber near Muskogee, Oklahoma. When Cordova was drafted in January 1943, he was initially part of the 86th Division but after basic training at Camp Howze near Greenville, Texas, he was reassigned to the 88th, 350th Regiment, Company B and thus part of a division whose commanders were determined to make the best of their time in the US military. After maneuvers in western Louisiana and East Texas from late June to early August, the 88th was assigned to Ft. Sam Houston as a reward for its “stand out” performance. In the fall, the 88th was sent to the east coast to deploy to North Africa and then to Italy. In 21 miserable days at sea, the troops had to stay mostly below deck on short rations and many were seasick most of the way across. Cordova developed his sea legs immediately and was not sick at all. For him, the trip was not so bad. In October, Cordova was in Oran, North Africa, engaged in something a flatland farmer had probably never dreamed of –mountain training. The US military was planning to take Rome by striking through the mountains, a plan that no other invading army had ever been able to accomplish in Rome’s long history. The 88th reformed in Naples, Italy, in February 1944 and staged in the Piedmont d’Alife area. Then they waited for the action to start. The wait was not quite as bad for Cordova because he could speak Spanish and his Spanish enabled him to speak to the locals – Italian and Spanish speakers can usually understand each other fairly well. But mostly, the 88th was impatiently waiting – waiting for the push for Rome. Elements of the 88th would be briefly deployed to relieve other divisions, but they saw very little action until May. In May, the push through the mountains and into Rome began. The Americans faced strong opposition on May 11 as they broke through the German Gustav line. They fought so fiercely, the Germans said those devils with the blue cloverleaf insignia were “blood-thirsty” cutthroats. The 350th was ordered over a mountain near Rome in June 1944, and “we went over it.” They were ordered to “dig in” but they could not. It was all rock. So Cordova and his buddy constructed a little rock enclosure a few feet high all the way around. It did not work. The next morning, Cordova was hit with an 88 round that left a chunk of metal the size of a fist in his leg. Cordova kept on advancing for about eight more hours, some of the time through a mine field, until he ran into a Red Cross Station. They told him it was time for him to go the rear. Cordova spent a month in the hospital and then another month recuperating before he was sent back to the front. “I was thinking I was going to go home but I didn’t. They returned me to my company and two or three weeks later, I became the squad leader.” Some of the Division’s heaviest fighting was yet to come. In August, the 350th was sent to assist in Livorno operations northwest of Rome and south of Pisa. It crossed the Arno River and continued advancing until it was relieved on September 6. After a little time off, Sgt. Cordova and the 350th was back into action from the third week in September and throughout October. The regiment advanced rapidly along the Santerno River Valley toward Imola. They used their mountain training on Monte Acuto and seized Monte Pratolungo and Monte del Puntale where they met strong German resistance. The Battle for Monte Battaglia, fought from September 27 through October 13, was extremely bloody, as was the Battle of Monte delle Tombe. The 350th took Monte Grande on October 20 but the offensive was halted on October 26 after over a month of hard mountain fighting. The Division dug in to defend the territory it had fought so hard to claim. In January, the Division was relieved for rehabilitation and Cordova rehabbed in Rome. And the good times rolled. The division started attacking again in April 1945. They took Monte Mario on April 18. They reached the Po River valley later in the month and Verona and then Vicenza. “We had them on the run,” said Cordova. When the German forces in Italy surrendered on May, the Blue Devils were advancing through the Dolomite Alps, heading for Innsbruck, Austria. Throughout those long days before the German surrender, Cordova and his squad would hitch rides on the tanks, then drop off to clear out Nazi “nests” along the sides of the steep mountain roads. When the mountain fighting was over, they fully expected to finish the war in Japan. “We were supposed to spend 20 days at home and then go back,” said Cordova. To get back home, they returned to Casablanca, boarded a ship to Brazil and then sailed up the coast to the United States. He was safely back in Texas when the atomic bomb was dropped and the Japanese surrendered. Cordova spent a little time in Fort Worth and San Antonio before being discharged. “I was glad to come home alive,” he said. He moved to Calvert in 1947, married a Robertson County lady and came to Hearne to work on cars. When he had the opportunity to buy the cleaners his wife worked in, he seized the moment and the rest is Cordova Cleaners history. Whenever you hear a story like Mr. Cordova’s, you’ve got to wonder what kind of “medal” it took to advance through a mine field with a fist-size piece of metal in the leg. Those young men coming out of the Depression were tough – they weren’t complainers. Those Bloodthirsty Blue Devils were certainly more than the Germans had bargained for. I was so excited to read this very interesting article about Adrian Cordova from Herne. My uncle, Irvin Conitz from Calvert, also served in the 88th Infantry Division, The Blue Devils during WWII. He didn’t talk much about the war, but would answer questions in his older years. However, I didn’t know enough to ask questions. He did tell me some things and, later, his sister, Thelma Conitz, filled in some things. I do have sme letters and v mails that he sent to his brother, my dad, and I was trying to transcribe them, adding in appropriate pictures, etc., in between the letters. They didn’t say a lot since they couldn’t tell where they were or what they wee doing. I have Irvin’s service record, medals, and lots of pictures, many unidentified. He kept in touch with some of the men in the Blue Devils over the years. I did not know that Mr. Cardova wasin that outfit. I know that Herman Yezak from Bremond and several others would go to some kind of reunions, but they didn’t say much. I did not know all of the places, dates, action , how they got home, etc. so this article was particularly interesting. When Irvin went off to war, his sister, Thelma, went to work at the POW Camp in Hearne doing secretarial work. She felt that, since her brother had gone off to war, this would be her bit for the war effort. When there were rumors of the war ending soon, she started teaching business subjects a Herne High School. She feared she would not have a job if the camp closed. As I read about the mountains, and their training and battles, I remembered a book that Irvin had sent home. “Mud , Mules, and Mountains”. We still have that book and one of cartoons bhy Bill Mauldin. If you are gathering stories of WWII veterans from Robertson County, I could send you some information about Irvin Conitz. He was very proud of his Army days. I remember talking to mt grandpa about this and was very interesting and i am glad i did. It is crazy because if he didn’t make it i would not be here today along with my family that i have. RIP GRANDPA AND THANK YOU AGAIN FOR SERVING OUR COUNTRY. I grew up on Hearne. My parents were Zane Grey & Mary Helen Wallace. I went to school with Janie Cardovw. I certainly remember the Cardova Cleaners growing up. Our Dads didn’t talk much about the war when we were kids. So many of our Dads were in the war, but it wasn’t a topic that was talked about or dwelled upon. They were just our Dads. It wasn’t until after so many of us grew up that we realized how much our Dads had contributed to WWII. We were living among heroes & didn’t realize it until we were older. Thank you for writing these tributes. So true my daddy shared many memories from his service. Thank God i get to display his flag and caps from GI Forum,American Legion and VFW. It’s really a cool and helpful piece of info. I’m glad that you shared this helpful info with us. Please stay us up to date like this. Thanks for sharing.